Our team of experts include a platinum status Invisalign® practitioner who is highly experienced in the use of Invisalign® and is able to offer top quality treatment to patients requiring alignment procedures. Invisalign® is a discreet and effective alternative to conventional orthodontic treatments. The Invisalign® system consists of removable aligners which are virtually invisible, giving patients the confidence and comfort to straighten their teeth with little interference to their normal routine. Invisalign® treatment is clinically proven to be effective. In the hands of an experienced Invisalign® provider, it can be used to treat mild to complex teeth straightening issues. What is Invisalign® and how does it work? 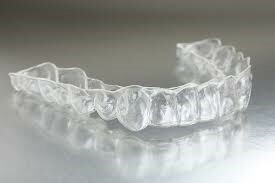 The Invisalign® system uses clear aligners (similar to mouthguards) that are custom made to fit each individual patient’s mouth. Invisalign® clear aligners are made of SmartTrack material which provides greater than 75% improvement in overall tooth movement predictability. Each set of aligners is worn for two weeks before changing to the next one, which is slightly altered to manipulate the teeth. These aligners are designed to fit in such a way that they put just the right amount of pressure on the teeth to move them little by little, gradually moving towards the final position. 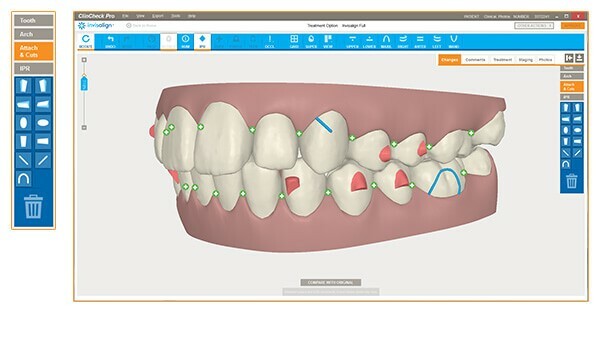 With our virtual 3D treatment planning software ClinCheck, you’re able to preview your new smile before treatment even begins. ClinCheck shows the series of movements that your teeth are predicted to go through over the course of treatment which enables you to see what your teeth are expected to look like when the treatment is finished, and also to monitor the changes as you go. We will always complete a consultation to ensure you are suitable for the Invisalign® treatment. At this appointment, we will fully discuss what you are unhappy with and also what you wish to have achieved by the end of the treatment. With this information, we will then fully discuss all your treatment options and determine whether your teeth can be adjusted using the Invisalign® system. We will also give you a clearly defined treatment plan detailing all you need to know about your treatment and the full process involved. Treatment times can vary depending on the individual, but results can take as little as six months. Occasional check-ups will be required to monitor your progress and ensure you are comfortable with the treatment. Studies show that without retainers, straightened teeth can gradually shift back towards their initial position. Wearing Vivera retainers after traditional braces or Invisalign® treatment means you’re keeping your teeth in their new position, protecting your smile and investment. The retention process will be fully discussed with you during your initial consultation appointment. Come in for a Smile Assessment to see if Invisalign® is right for you. Call now to book an appointment!